ABBOTSFORD Police on Wednesday responded to a 911 call of a man assaulting a woman in the 33300-block of Hawthorne Avenue. Witnesses reported a woman being assaulted and dragged to a vehicle and forced inside. 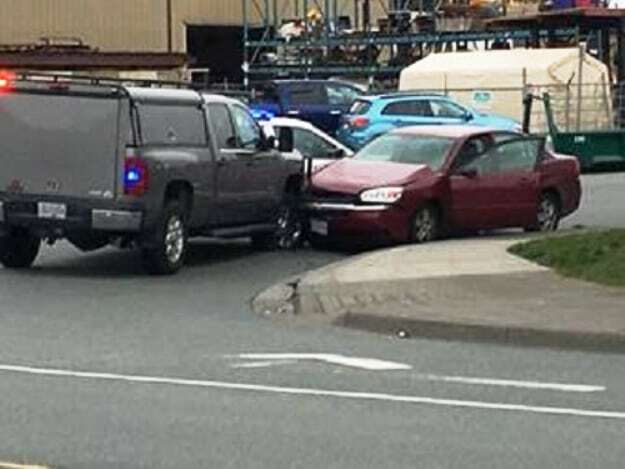 When police arrived at the scene, the suspect vehicle, a red 2005 Chevrolet Malibu, fled with the suspect and victim. After a short pursuit, Abbotsford Police deployed a spike belt and boxed in the suspect vehicle at Wheel Avenue and Towline Road. The suspect vehicle collided with an police truck. Officers arrested the suspect without incident or injury. The victim, a 23-year-old woman who is known to the suspect, was taken by EHS to hospital for medical treatment. No police officers were injured and the police truck that was hit by the suspect vehicle had only minor damage. A 22-year-old man is facing charges of forcible confinement, assault with a weapon, dangerous operation of a motor vehicle, threatening and breach of a no contact order. In addition, the suspect was arrested on numerous outstanding warrants of arrest for charges that included assault and threatening. Anyone with information is asked to call the Abbotsford Police Department at 604-859-5225, to text APD at 222973 (abbypd) or to call Crime Stoppers at 1-800-222-8477.